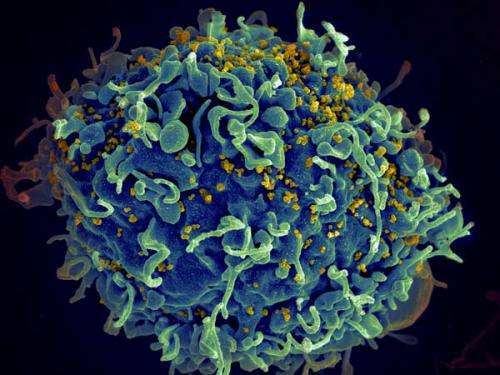 (Medical Xpress)—Individuals with the natural ability to control HIV infection in the absence of treatment are referred to as elite controllers (ECs). Such individuals maintain undetectable viral loads less than 50 copies per mL without therapy. Elite controllers have clinical characteristics that differ from noncontrollers, including protective HLA alleles and a tendency to maintain a much stronger cytotoxic lymphocyte (CTL) response. However, clinical studies have established that antiretroviral therapy (ART), while not a cure for HIV infection, may induce post-treatment control (PTC) of HIV infection in noncontrollers if initiated early enough during the primary infection. These post-treatment controllers exhibit viral suppression remarkably similar to ECs, even years after suspending ART. According to medical professionals, PTC constitutes functional cure—sustained remission that requires no further therapy. In an effort to characterize the development of PTC and better establish clinical procedures to induce it, a group of researchers from Pennsylvania State University and Los Alamos National Laboratory have developed a mathematical model of PTC. The model produces results analogous to those found in clinical studies and also makes a number of testable predictions about the development of PTC. They have published their results in the Proceedings of the National Academy of Sciences. Early during primary HIV infection, the virus establishes reservoirs of latently infected cells. These cells are unaffected by ART and they undergo homeostatic proliferation. Despite a relatively small size in comparison to general HIV infection, the reservoir has a long life, and the activation of these latently infected cells are considered a primary suspect for persistent viremia. ART during the primary infection is known to reduce the latent reservoir size, and is one of the dynamics the researchers incorporated in the mathematical model, which was created to explore the hypothesis that potent early treatment of HIV drives viral loads below the limit of detection while also interrupting the formation of the latent reservoir. Thus, following ART cessation, the adaptive immune system is able to control HIV. The model predicts that in the presence of a very strong effector cell response to HIV, the infection will always be controlled, as is the case in ECs. For noncontrollers with weak effector cell responses, the model predicts that viral rebound will occur if therapy is interrupted, but that a midrange in effector cell strength exists, where both high and low viral load set points are attainable in the absence of therapy. Which set point is actually attained depends upon the latent reservoir size at the time of therapy cessation. There exists a range of typical effector cell responses where PTC cannot be attained, no matter how small the latent reservoir. Unfortunately, this aptly describes the majority of infected patients. Boosting the immune responses of these patients before terminating ART might enhance the chances of inducing PTC. Because weakened or compromised immune systems may result in viral rebound, the model suggests that physicians should exercise caution when prescribing corticosteroids or other immune suppressants aimed at treating unrelated conditions in post-treatment controllers. Control of HIV will always be attained within a regime of very strong effector cell responses, even after cessation of therapy. Such is the case of the elite controllers. Between these two regimes, the model predicts that PTC is possible. Where it is possible, effector cell response strength between PTCs and viral rebounders is indistinguishable. This is strong evidence that PTCs are not characterized by the same clinical traits of the elite controllers, such as protective HLA alleles and HIV-specific immune responses. Importantly, even for CTL strength sufficient to induce PTC, the latent reservoir size must be small. If it is too large, or if it is activated too strongly, viral rebound is likely after cessation of ART. The researchers note that if ART is initiated too early, it may inhibit robust immune responses, and suggest that the use of latency reverse agents might be preferable prior to ART. For future therapies, they recommend more robust data collection on effector responses, latent reservoir sizes, and rates of latency reactivation. Antiretroviral therapy (ART) for HIV is not a cure. However, recent studies suggest that ART, initiated early during primary infection, may induce post-treatment control (PTC) of HIV infection with HIV RNA maintained at <50 copies per mL. We investigate the hypothesis that ART initiated early during primary infection permits PTC by limiting the size of the latent reservoir, which, if small enough at treatment termination, may allow the adaptive immune response to prevent viral rebound (VR) and control infection. We use a mathematical model of within host HIV dynamics to capture interactions among target cells, productively infected cells, latently infected cells, virus, and cytotoxic T lymphocytes (CTLs). Analysis of our model reveals a range in CTL response strengths where a patient may show either VR or PTC, depending on the size of the latent reservoir at treatment termination. Below this range, patients will always rebound, whereas above this range, patients are predicted to behave like elite controllers. Using data on latent reservoir sizes in patients treated during primary infection, we also predict population-level VR times for noncontrollers consistent with observations.